Where is Marble Canyon and why does it matter? 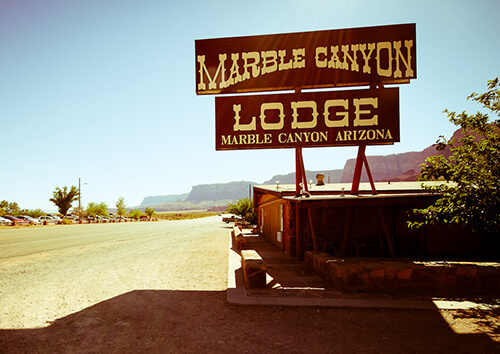 If you are joining us on one of our 7 Day Motor trips you’ll become familiar with a town called Marble Canyon. Marble Canyon is pretty tiny, essentially Marble Canyon consists of the Marble Canyon Lodge, a Chevron gas station and a few houses. This little outpost in Northern Arizona is immensely important for the river community because it is just an 8-minute drive from where you will put in on the Colorado River. There at Lees Ferry, the boats and gear are waiting for you to start your river trip. Many of our guests will be staying in Las Vegas and taking a fixed-winged flight to the small airstrip located across the street from the Marble Canyon Lodge. After the planes land, the river guides will meet you and start to pack your duffel bags into 16-passenger vans. If you’d like, you can walk over to the Chevron gas station to purchase beer and wine for the trip. After orientation, you’ll hop in the vans and take the short ride down to the boats. If you live in the Southwest United States and can drive to this small town and actually stay at the Marble Canyon Lodge. We usually see this when guests live in Arizona, New Mexico, Colorado or Utah. If you are staying at the Marble Canyon Lodge, plan to meet our river guides at 8:00 a.m. for a light, continental breakfast and orientation. Looking at the Chevron gas station, the guides will be outside in the small grassy area just to the right (east) of the Chevron. Please be dressed ready for the river and have your gear with you. You’ll start to see the planes land at the airstrip across the street just before 8 a.m. and the guides moving the vans around. If you drove, you can leave your vehicle in a dirt parking lot across the street from the lodge free of charge. After the trip is over, you’ll reach the Bar 10 Ranch by helicopter; from there you’ll either fly back to Las Vegas or to Marble Canyon. 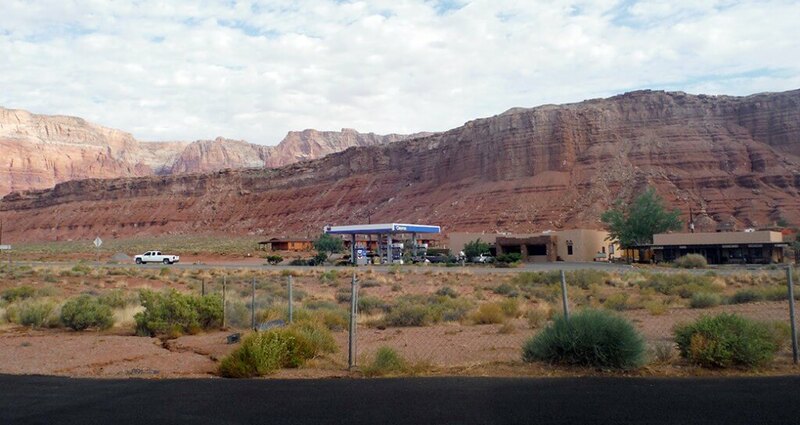 So that is the famous Marble Canyon, Ariz. in a nutshell. Don’t hesitate to call us if you have any questions. Thanks! 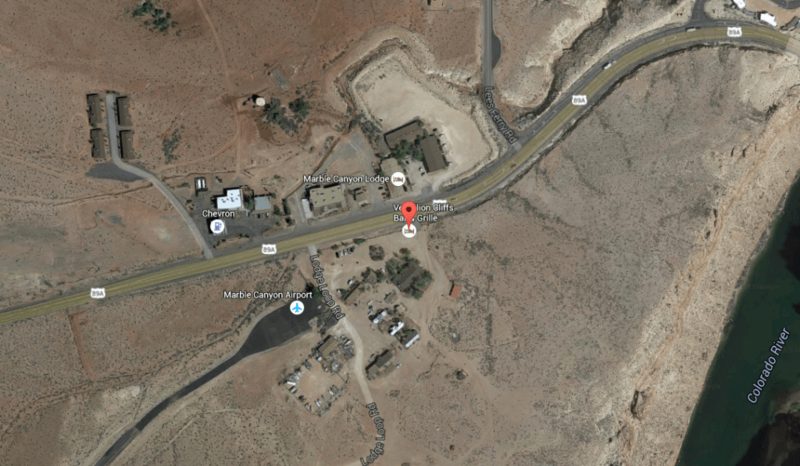 Google Map of Marble Canyon, Ariz.
Marble Canyon, Ariz., showing the lodge to the right and the gas station to the left. 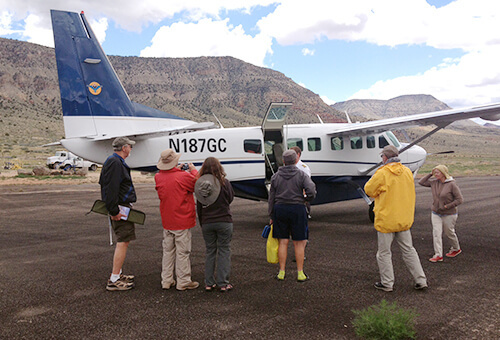 GCW guests at the Marble Canyon airstrip. The famous Marble Canyon Lodge.